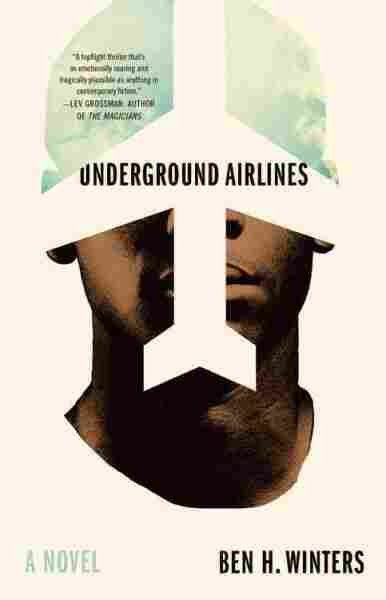 'Underground Airlines' Presents A Scarily Realistic Alternate History Ben H. Winters' new novel is set in a modern-day America in which almost everything seems normal — except for the fact that the Civil War never happened, and slavery is still legal in four states. Underground Airlines will start a lot of conversations. A lot. The book's narrator is an African-American man living in a near-future United States in which slavery has never been entirely eliminated ("Big Abe," meaning President-elect Lincoln, was shot early in his campaign, and several Southern states amended the Constitution to retain it). Worse, he's working for a Union that supports slavery through its cooperation with the "Hard Four" states that maintain it. This man, whose name is generally Victor, simmers with rage early on and throughout: "I remember them. I remember them all" he says, of the men, women, and children he's been forced to hunt down. "... it was my practice at the beginning of a new job, to think of myself as having no name at all. As being not really a person at all. A man was missing, that's all, missing and hiding, and I was not a person but a manifestation of will. I was a mechanism — a device. That's all I was." Alternative-history fiction is nothing new, and it's been done by the best (The Plot Against America, anyone?). Still, Winters reels readers in with details like Victor's tiny tracking implant ("When I was too quiet for too long I heard it singing in me: humming, taunting, burning. A hook. An anchor. A leash.") and letting another character reference a "Mockingbird mentality" referring to "that novel" — quiet ways of letting us in on the changed future. Victor is in pursuit of an escaped slave known as Jackdaw. We first meet Victor while he's based in Indianapolis, using the pseudonym of Jim Dirkson. He's having lunch with one Father Barton, a minister involved with the "Underground Airlines" rescue network of the title. As noted, Victor isn't wholly happy with his lot, but we won't learn why for many pages — and this is the trouble overall with the novel. By the time we learn important plot points, we've ceased to care. Hold that thought. The author adheres a little too closely to the conceits of classic noir: Victor is a victim who's self-destructive, dealing with a corrupt society and a troublesome woman. Victor, urged on by his overlords, chases Jackdaw carefully and thoughtfully. Unfortunately for all his care and thought, he meets a young white woman named Martha who has a young multiracial son named Lionel, and it seems every time Victor is on the verge of success in his mission, Martha shows up and distracts him. Whoops, there's another flaw in Underground Airlines: The author adheres a little too closely to the conceits of classic noir: Victor is a victim who's self-destructive, dealing with a corrupt society and a troublesome woman. Most readers will happily overlook the cookie-cutter details as they'll be caught up in the alternate nation the author has created, one in which Texas went to war against the Union to fight for abolition, in which Montreal has become a Francophile haven for escaped slaves, in which some states have old-fashioned towns that keep Jim Crow statutes. If the denouément comes too late for us to care, well, we've learned along the way that this alternate nation, with its Pigmentation Taxonomies and Freedman Towns, is ugly and evil. But there is an important, albeit slight, part of this novel that transcends the evil, and I wonder what might have ensued if Winters had chosen to write more of it: I'm speaking of three brief, italicized sections in flashback that explain where Victor is from and how he left that place. He talks about a brother named Castle and when he details Castle's attempts to educate him and how the "Hard Four" system works, the writing leaves the realm of noir and becomes almost lyrical. It hasn't escaped me that I am a privileged white woman, reviewing a book dealing with slavery and written by a white man. For book groups who take on Underground Airlines, consider pairing it with Octavia Butler's classic Kindred for a balance of gender, race, and generation. Bethanne Patrick is a freelance writer and critic who tweets @TheBookMaven.